FeaturedPosted on March 21, 2019 March 31, 2019 Categories PoetryTags Art, Books, Dreams, life, Women, writing5 Comments on Mother’s Day? FeaturedPosted on March 17, 2019 March 17, 2019 Categories QuiltingTags Art, Design, SharingLeave a comment on A Quilting Day? What does the word “book” conjure up for you today as we celebrate World Book Day? I don’t know about you but I certainly would find it extremely difficult to survive without a book. What am I saying? Just one book? Oh no, that just isn’t me. I have been taking stock of my craft room having had to remove all my paper/card stock together with the numerous items needed to make a greeting card. All this stock will find good homes but I can no longer work with the card stock. However, as a result shelf space is gradually emerging. I think that at long last I may just, find space for a library of sorts. I am afraid to actually say the word library just in case it doesn’t happen. However, space seems to be appearing for those books over the years I have not been able to donate, give away or sell. These are the books which I have read so many times that they have become part of my life. They are many and varied. Some would have been used on a daily basis at certain times of my life.Some are what I call dippers. Those books I dip in and out of. Then there are my poetry books which have meandered into my life. Craft books which have helped me through those endless sleepless nights. Cookery books which in turn have led me to travel books. Sports books where I have been led to take part but from a distance. Computer books in the hope of my mastering my laptop ( which has never happened!!) Novels which have allowed me to escape: which have allowed me space to imagine. Authors have invited me into their make-believe worlds and I have gladly accepted those invitations. I love this piece of art by Rae Andrews entitled “Comfy Chair”. It was the book which caught my eye as I wondered what the title was. Perhaps a comfy chair is what i need in my “library”…..
Books: tactile, warming, questioning, inviting…. FeaturedPosted on March 7, 2019 March 7, 2019 Categories BooksTags Art, Conversation, life, Sport5 Comments on Where does it lead you? Did you know that some countries celebrate Fairy Tales today. No? Me neither. I am probably one of the minority who really don’t like fairy tales. I always found them sinister and really frightening. I could never get away from the evil images. Nightmares usually ensued after reading a fairy tale. My son was deprived of many fairy tales as it was his father who read them to him and not me. Give me Winnie the Pooh any day or Peter Rabbit but there is no room for fairy tales on my shelf. I do have one exception…..Tinkerbelle. FeaturedPosted on February 26, 2019 Categories BooksTags Art, Dreams, Family, writing1 Comment on National Tell a Fairy Tale Day! Do you ever find that you sometimes need a reminder? That sometimes unwittingly you fall back into old patterns? It made me stop and breathe. It made me stop and realise I was reacting in an old manner which wasn’t healthy for me. So just in case you may need a reminder…. Can You Overwhelm the World? I think we sometimes forget just how powerful the smallest act of kindness can be. It doesn’t have to be an all blazing flashing lights act. Simply saying hello to someone whom you meet as you take your daily walk can change someone’s day. Having the courtesy of not answering your mobile/cell phone at the check out in a shop. The person at the check out deserves that little bit of courtesy. How about saying “thank you” a little bit more often. They are two powerful words which lead to overwhelming kindness if we all took it on board. Although sometimes it feels as if it is only a minority of people who are showing kindness it is still powerful. So today start the battle of kindness you just never know where it might lead to. 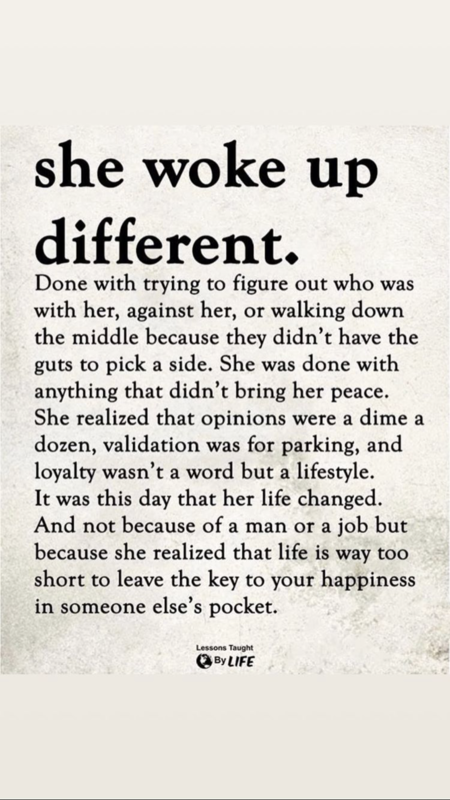 I think why this is resonating with me is that I called to a travel agency a few days ago and although the agent wasn’t overtly rude the over-riding feeling I got was of being dismissed. Thinking it was only me I didn’t say anything but on leaving a few minutes later hubby, who is generally the quietest gentlest man you would meet, said ” never again and I would definitely never recommend that travel agency. I will not be dismissed like that again”. Wow I was taken aback. This called for an immediate cuppa. Well the young staff in the nearest coffee shop were the total antithesis of the travel agent and totally restored his faith in human kindness. As my waistline, well really all of me if I am to be honest, has greatly increased in size. 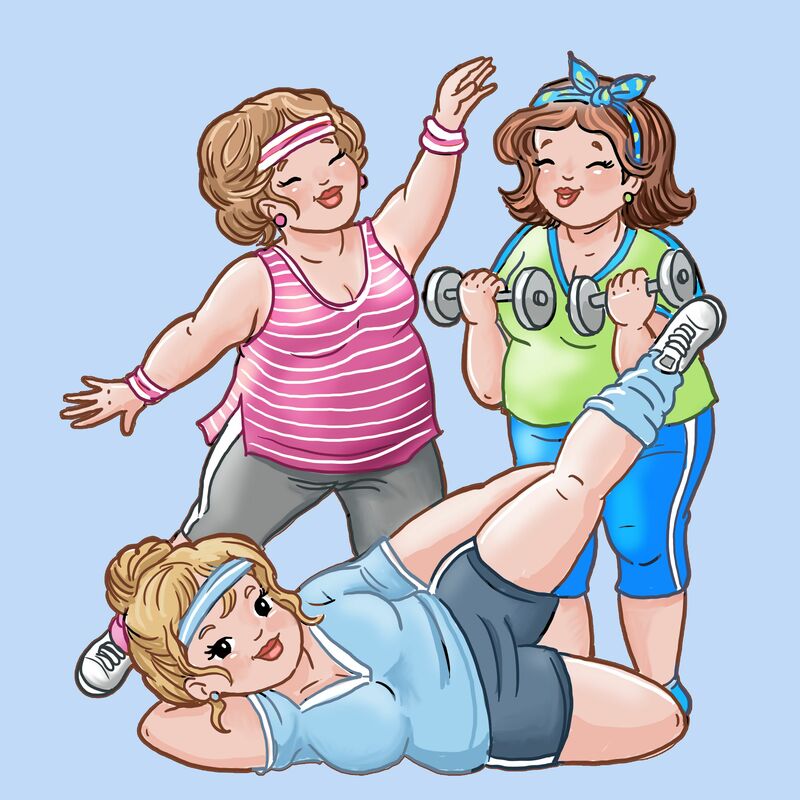 Sooo, I decided to join a slimming group. I have done it before but never found the groups overly friendly especially if attending on one’s own. Yesterday back after the initial week and two people engaged me in conversation. I was so delighted that they went out of their way to speak with me. It may not have meant anything to them but it made my day. So perhaps we can all do our bit to overwhelm the world in a good and positive way. The strange thing about showing kindness towards others is that it comes back to you. So it is a “win win” situation. FeaturedPosted on February 10, 2019 February 8, 2019 Categories KindnessTags life, Sharing3 Comments on Can You Overwhelm the World? I don’t know if anyone lives with psoriasis which is a pesky skin condition which can be genetic or triggered by the environment and to which there is no known cure. So it is a case of managing the symptoms. What I have found very hard to deal with is the itch that is attached to psoriasis. Especially when they occur on the face. You can image you are talking with someone and then your nose starts itching and you suddenly turn into Samantha from Bewitched ( the TV programme for those of a certain age). Or inside the ear starts to itch and there is no way one can just start scratching and making things worse. I have found something which relieves the itch and it is made right here in Ireland. It is called Emmy’s Balm and made in Lucy’s Soap Kitchen in county Leitrim. I am on a high! Oh my it is so great. I can use this balm at any time and it really soothes the skin. Now I am just so happy to have a balm which has eased my situation. Perhaps it may be of help to you. https://www.lucyssoapkitchen.com is the web address. Now on the website there are other products among which is absolutely beautiful soap. Yes I know if one has psoriasis one is not supposed to use soap. But sometimes I just have to break out and am I glad I did. “Bleating Soap” just called to me. It is unscented which is great and it is made from goats milk. It is so soft and so gentle. In fact it is a little piece of luxury. The other product which I have now used is a mosituriser. Oh but it is soooooo soft and gentle. It is absorbed very well even on my patchy, pesky skin and the beauty of it is that I can use it as often as I like. The other thing I really like about it is its colour which is Avocado green!! Personally avocados and I are not soul mates. I cannot stand eating them but in this mosituriser we are in a totally different world. It feels so luxurious. It is also nut free, gluten-free and preservative free. Now before anyone asks “No, I have not been paid for writing this blog post.” I just am on a high having found products which I can use on my skin without causing further discomfort. But, as I said before psoriasis is a pesky condition so it is wonderful to have products which are easy to use, made from natural products and the added bonus they are made here in Ireland. Now just to be perfectly clear anyone can enjoy these products. One doesn’t need to have a pesky skin condition. Anyone can enjoy these wonderful products. I have only tried tow products so far but maybe I just might try a few more. 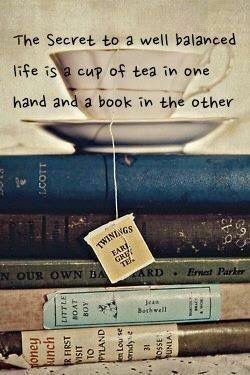 My life may not be totally in balance but a good book and a “cuppa” certainly help. FeaturedPosted on January 13, 2019 Categories BooksTags Balance, Conversation, life, Tea2 Comments on Balanced Life? I was asked recently what phrase or word, other than “I love you”, would I consider to be of paramount importance. For me it is “Thank You”. Those two words can lighten my day. They can bring such a feeling of worth and can at times validate me. This means that when I receive a “thank you”, I now know it is genuinely meant and thus making it so much more important than ever before. Today when I held the door of a shop open to allow someone to exit that person said “Thank You” and it certainly made my day as there is generally no acknowledgement. In fact fairly recently I held the door, open as I would, to allow a young lady to exit rather than barging my way into a shop only to be greeted with “It is no wonder that women are still looked down upon, when we still have women like you holding doors open.” I was so stunned that what to me was politeness would be seen as putting down women. I hadn’t realised that things had changed so much that a gesture of thoughtfulness would be seen as an insult. Things have changed. I hadn’t realised just how much value I put on those two words. Does it matter then when people do not express their thanks? For me it is important but for others it is way down their list of priorities. I have come to realise that I have to accept that difference, but with the proviso that the phrase “Thank You” is important to me and perhaps others need to respect that. Or am I asking too much? FeaturedPosted on January 6, 2019 January 5, 2019 Categories wordsTags Books, Conversation, Dreams, Fabric, life, Response2 Comments on Today It means something. For the first day of 2019 I think this is so apt. 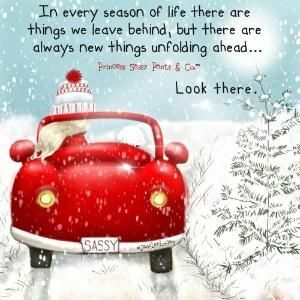 FeaturedPosted on November 25, 2018 November 25, 2018 Categories BooksTags Clearing, life, readingLeave a comment on Beginnings or are they endings? What attracted me to this picture wasn’t the saying but the gorgeous scarf. I wonder what the actual print looks like? Is this scarf a long rectangle of silk or perhaps a large square of cotton? It took a few moments before I read the writing. I normally read the back page of the newspaper while stirring my porridge. Yes an actual newspaper. I have tried reading the paper as an e paper but it was just not the same thing at all. Now the paper is delivered in the morning well in advance of breakfast. Anyway, this morning having already read the paper I started to read the Saturday Magazine while stirring the porridge. I came across an article about accessories. The article was highlighting just one company and its accessories. Then I saw yesterday, that Niamh Daniels a wonderful silk scar designer, https://niamhdaniels.com, is showing her beautiful Silk Scarves in the Dundrum Centre, in Dublin today. But, not only are her scarves been modelled she is also demonstrating the different ways of wearing a scarf. That is an art form in itself. So what a great way to start a day, porridge, an article on scarves and a pot of tea. FeaturedPosted on November 15, 2018 November 13, 2018 Categories sleepTags Books, Dreams, Papercraft, QuiltingLeave a comment on Sleep that elusive concept. FeaturedPosted on November 13, 2018 Categories ExerciseTags Motivation, Musings, reading, Sport, WomenLeave a comment on Exercise? The scarf is really not just a simple piece of fabric which can be used as just a cover. It is much more. 81 years ago last month the iconic Hermes 35 inch square scarf was launched. Today there are over 800 designs. It was launched for the newly emerging emancipated woman who still had to keep her hair “in order”. When Princess Grace of Monaco, formerly Grace Kelly, visited Ireland she wore a leopard print scarf as she climbed Croagh Patrick. I can remember as a child thinking that she was the most beautiful woman in the world. She moved the head scarf in Ireland from being the ordinary every day wear to the “Sunday Best”. The head scarf became as grand as a hat. The French fashion designer and children’s author Sonia Rykiel once described a scarf as “to be the most beautiful thing ever invented to wear”. Wow, that is some claim. Perhaps you mightn’t agree with the statement but a scarf can add to an outfit, it can make an ordinary jumper into something special. I t can add that needed splash of colour. I adore scarves. I have scarves which are over thirty years old. A scarf can be the colour link in an outfit. Of course scarves can be quite ordinary but do a great job of keeping one warm. These are what I call the “essential” scarves. Then again any scarf I wear is essential for me. I enjoy making my own scarves but not however in silk. I leave that to the likes of Niamh Daniels https://niamhdaniels.com absolutely beautiful silk scarves designed by Niamh. However, if the occasion occurs when I don’t have a scarf to tie in with an outfit I will make a scarf. This occurred recently when I realised I had no scarf which matched both my coat and the outfit underneath. Some cotton fabric was turned into the ideal scarf. I couldn’t imagine not having scarves in my wardrobe. They are as important to me as bags, gloves and of course shoes. FeaturedPosted on November 10, 2018 November 9, 2018 Categories ScarfTags Accessories, Clothes, Conversation, Musings4 Comments on The Simple Scarf? I came across this during the night and the thought has remained with me. Sometimes we need a little reminder that we need to depend on ourselves and learn to do it regularly. I was sent this today and it is so true. There are so many times when we compare ourselves to others. Sometimes we don’t say it out loud but saying it privately to ourselves can be even more destructive. It is the last line which has struck me as being very powerful “Gratitude turns what we have into enough”. Wow, just take a second and think about it….. I was scrolling through comments on a group I have recently joined on social media. I came across a comment and thought that like me someone had typed too quickly. However, on reading further I realised that no this was a word I had never heard before. Off to my trusty dictionary, yes, I am old school; dictionaries before Google every time. Our son added a “Bloomsbury English Dictionary” to the “Reference Library” and I just love it. It has encyclopaedic features which for me just adds to the dictionary. Yes, I have gone off on a tangent yet again. Back to why I was searching in the dictionary. The word I was looking for was “persimmon”. I can hear so many of you laughing wondering how she could never have heard of a “persimmon” but there you go I never had. Just in case there is a slim chance that there is someone else out there who has never heard of “persimmon” let me give you the definition: “a juicy smooth-skinned orange-red fruit that is sweet only when ripe”. Really, I had never heard of this fruit which led to further investigation. Whenever I have a query regarding plants it is to The Farmer’s Almanac that I turn to. 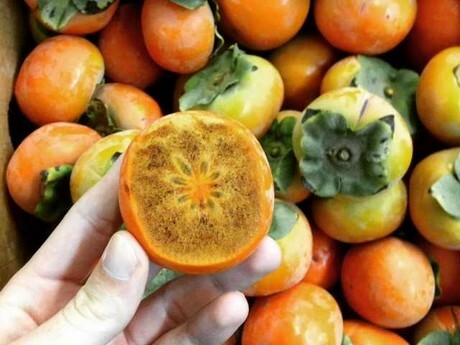 Persimmon is a berry which is also known as “The Divine Fruit”. What a wonderful name. According to folklore if you open the persimmon seed it will forecast what type of winter is to come. A fork shaped seed indicates a mild winter. A knife-shaped seed indicates it will be bitingly cold and “cut like a knife”. A spoon-shaped seed indicates a large amount of snow. How accurate this forecast is I am not too sure? There is even a “chocolate” persimmon. I didn’t realise that today I would be learning about an exotic fruit which originated in china, is widely grown. In the is U.S.A. it is grown in areas from Florida to Connecticut and Iowa to southern Texas. The two main areas in Spain are Valencia and Huelva. It is grown in New Zealand and as their harvest is a few weeks in advance of the Californian harvest they now export to California for that short period. It is grown in Japan, Korea and China. The saying that education never ends is certainly true. So I am on the lookout for “persimmon” in my local greengrocer an eagerly waiting to try one!!!!!! 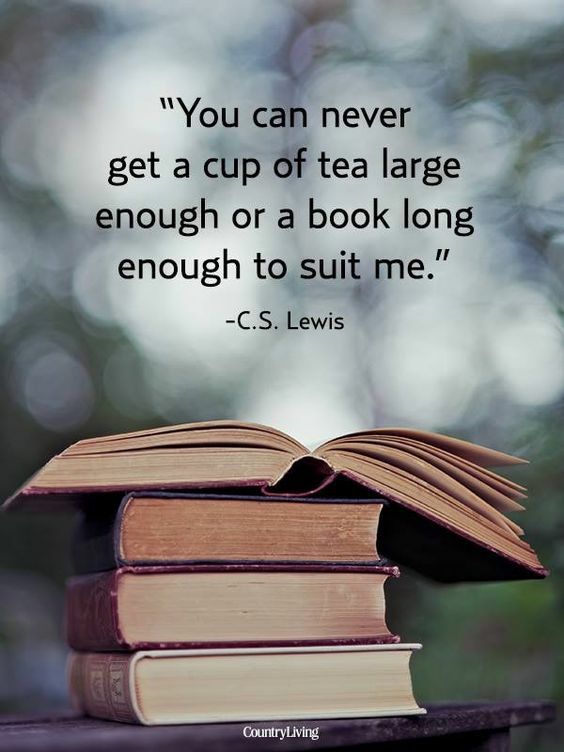 I have to agree with C.S.Lewis. I have been trying to find a cup or a mug large enough to last a chapter of a book never mind a complete book. However, the shape was wrong, or the pattern was wrong, or it wasn’t china which for me is a prerequisite for any cup of tea. Fussy? Yes totally. Then I got a present from another tea loving friend. Yes, a mug which I can wrap my hand around: the tea stays warm in it and it is CHINA. How lucky can one get? Then there is the little extra. When I get to the bottom of a wonderful mug of tea there at the bottom of the mug is the question “Another cup?” Now that is what I call a thoughtful present. Do you find there are people who have this uncanny knack of choosing just the correct present? They seem to know what would stir the heart. They have this uncanny knack of picking up something which you didn’t even know you would like. Now I could spend months thinking about the gift, but I don’t really think I get it right or if I do it really is a fluke. I do however like the process of trying to figure out a good present for someone. I have concluded, that having put the time and thought into the gift, irrespective of how it is received, is more important to me. This way it is not a chore but a delight. So are you the perfect present chooser? What is Time Telling You? I certainly am one of those people who over thinks situations. Does it help? Like heck it does. It just sends my mind into a whirlpool of uncertainty. I thought this was an aspect of my personality I had under control but just like the weeds in the garden I had forgotten to keep a wary eye out for falling back into an old thinking habit. I suppose it is like everything else in life there is a constant need to keep practising good routines. Although it is said after 12 weeks of making a new habit it will start to become part of one’s life, when I am changing a habit which has been part of me for sixty years then getting reminders is not just a help but a necessity. This afternoon an email popped up from a blog I follow and the following is what greeted me. How do you know? How? What a brilliant poem. Time is telling me to stop the second guessing. What is time telling you? FeaturedPosted on September 4, 2018 September 4, 2018 Categories TimeTags Conversation, Habits, life, Procastinating6 Comments on What is Time Telling You? What are the little things which give you a lift? What are those things which make you stop and feel thankful? Now I am not talking about those grand gestures I am talking about those small gestures. I was in the middle of the clean up getting ready for the weekend and all those household chores just had to be done. It was an ideal morning for it. The sky was grey but with a hint of blue. The sun hasn’t really got it heat going yet so the house was cool ideal for getting those floors cleaned. Everything was ready for cleaning. Andy Williams accompanying me as I set to in the shower room. The washing machine was given the bass beat as it came to the end of the first wash of the day. The kettle and teapot, however, were calling to me that I needed a break, but I like to get the work done before breakfast. While lugging out the hoover I heard the letterbox click. 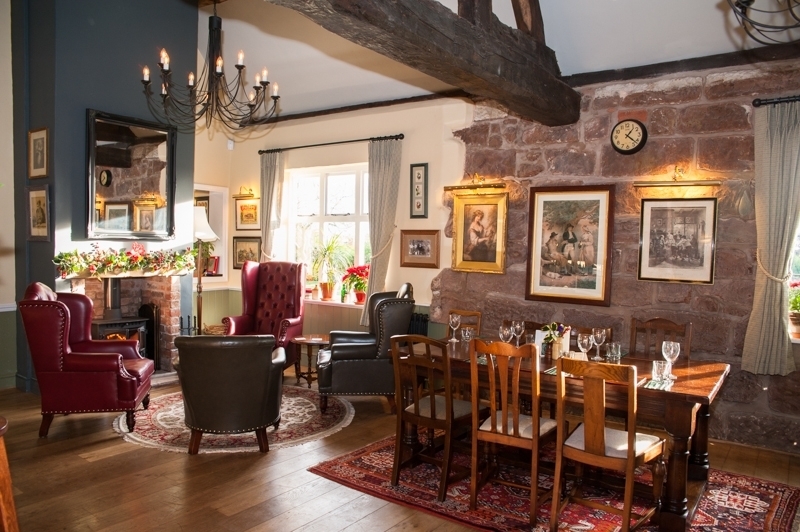 Although there were no up coming birthdays, anniversaries and no celebrations in the offing there was always the hope that the post might, just might, include something other than bills. It was my lucky day. Among the bills nestled a hand-written envelope for me with a foreign stamp. Now that is what I call post. I put the letter into my pocket and returned to the house work. Suddenly mopping the floor wasn’t so bad. Dusting the skirting boards wasn’t going to be ignored as it was just another little job. Then I found myself with my steps clearing out the top of the china cabinet. Singing along with Andy. It was a good day. Two hours later, chores completed, clothes washed and hung out, hoover put away for another day and steamer stashed neatly away; the tea was made, and the tray brought out to the garden now that the sun was giving off some heat and it was time to open the letter. The anticipation is part of receiving a letter in the post. I slowly opened the letter and I was soon transported to Washington State through the letter writing of a new friend. So, for me a little piece of heaven was to receive a hand-written letter. It totally brightened up my day. It totally gave me a lift. I felt so thankful that someone thought enough of me to take the time to hand write a letter and then post it to me. I felt special. I hope you have experienced something similar and I would love to hear what it was which lifted you up. This is my last post with the theme “goals”. Perhaps the use of the word “dreams” rather than goals maybe more appealing to some. However, for me dreams are intangible. They cannot be touched and so cannot come to fruition. But when I began to think about the goals I have set for myself I realised that they started when I noted down, without any rules , those funny, impossible, madcapped, and personal dreams in my trusty journal. They were outlandish, they were trite perhaps to others, they seemed impossible or some were just wishful thinking. BUT they were my dreams or aspirations. The dreams were personal but once they were there in front of me having been given colour they began to become achievable. Well, perhaps not all of them. Yes, I still have those dreams that I will never see come to fruition but hey that’s fine with me. I still enjoy the dreams. I will give you an example. One of my dreams which has become a constant in my journaling is to dance. Now let me explain, I may have the rhythm in my head, but it never actually reaches my toes. It is official that I have two left feet. This doesn’t stop me loving and admiring the beauty and strength of ballet; the rhythm, costumes and history of national dances: imagining myself dancing on Strictly come Dancing or Dancing with the Stars; watching young people performing modern dance with such innovative moves; trying to do the moves from Hairspray on the Wii; or imagining me attending a 1940s themed dance and dancing the jive, the jitterbug or the swing. I have enjoyed the process of trying to turn those dreams into attainable goals. Researching how I can do something and through that research perhaps realising that the goal is not something I need or want. Sometimes the research has led me down a totally different path which has proven to be far more enjoyable and enlightening. These dreams or goals do not have to come to fruition; sometimes just starting the journey is enough. The recent post on Goals dated August 7th has led to me receiving more emails than for any other blog post. I was amazed and humbled that people would take the time to post a comment or to send me an email. It was a surprise to me that the topic was engaging with so many. Three different emails voiced their concern over the use of the word goals. It is a word I have and difficulty with myself. For some people the word goal sends shivers down their backs and it certainly used to with me. Goals can sometimes seem to be these insurmountable objectives or aims which cannot possibly be achieved. There have been many times when the goals I have set for myself have not been achieved and I have beaten (verbally) myself up over the failure. However many times those goals were not my goals but goals which others thought I should be aspiring to. One lady always perceived the word goal as being a “male” word. She doesn’t know why but it has led her to ignore the word and use the word “objective” instead. Yet another lady wrote how once she substituted the word project for the word goal and since doing that she has achieved much more. While another lady uses a journal to tease out what she would like to achieve. She usually starts this in September and uses word picture and together with actual pictures to set up what she would like to TRY and achieve. She states that it is the trying that is so important to her. Now I must admit I really like the way this lady thinks. I like the idea of word pictures but I must say I really like the idea that it is the journey that is so important. Many times I have found myself deviating from the goal I had set and finding something so much more enjoyable or something more important to me even though I hadn’t realised when starting out. All the correspondence I have been privileged to receive, has shown me that first and foremost we are all different. Secondly, goal setting is not the prerogative of any one age group. Thirdly the title “goal” has different meanings for different people. The Oxford Thesaurus gives the following variations to the word goal: “object”, “aim”, “purpose”, “end”, “objective”, “target”, “ambition”, “ideal”, “aspiration”. Thank you for reading. 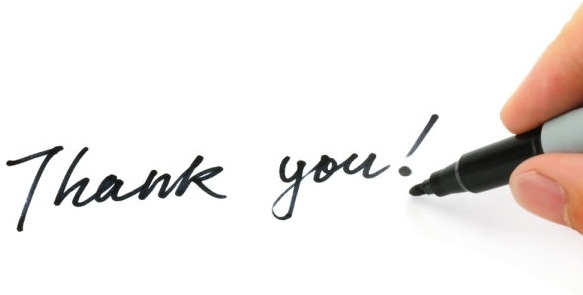 A special thanks to those who have posted comments on my blog or who have emailed me directly. Thank you. FeaturedPosted on August 15, 2018 Categories GoalsTags Aims, Ideals, Musings, Objectives, Sharing, TargetsLeave a comment on Goals or perhaps….? I received an email from a lady who follows this blog. This is the first time I have received an email from her. She saw goals as huge life changing ideals. They were to be set, worked upon and accomplished in order to progress in one’s career. There was no need for anyone to make goals otherwise. She did not see how retirees or stay at home mums, could possibly have goals to make, as these people were “not contributing to society”. I was taken aback by this email. Firstly , that goal setting was the prerogative of the young. Secondly, the idea of stay at home parents could not possibly have a contribution to make to society nor could retirees which is an idea I totally reject. Where did these ideas come from? Wow, I was flabbergasted. After exchanging a few emails I learnt a few things about this lady. Firstly, she is articulate with a great turn of phrase. Secondly, she is a retiree of two years having been a teacher for over forty years. Thirdly what I would have thought of as setting goals she saw as mere trivial dreams. She also concluded that I must have more time on my hands if all I could really blog about was dreams but she would still continue reading my blog. What do you think? Are you a goal setter? Do your goals help you to get the best out of life? Or perhaps you don’t need them. I would love to hear what you think. FeaturedPosted on August 10, 2018 August 10, 2018 Categories Books, UncategorizedTags Book, Musings, Poetry, reading4 Comments on Did I Really Miss It? I don’t know about you, but I have the habit of noting down sayings, adages or words which evoke a response. It may be years months or days before I reread them or even remember them. Then there are the quotes which keep on appearing in various reading locations. I found the following quote when I found a journal buried in the bottom of my Christmas fabric box. The quote I had written on the first page, but I had also found it written on numerous other pages in the same journal. Obviously, it had resonated with me years ago and it is really resonated with me today. Don’t let the past confine you. Take charge of your life with confidence and determination. There are no limits to what you can do or be. Can you imagine what a world we would have if we could instil this into our young people? Can you imagine what the next generation could achieve? However, I believe that this idea is something any person could take on board at any stage of their life. That this quote could enhance the quality of anyone’s life. I really like the line; “take charge of your life with confidence and determination”. Wow that is so powerful. Taking charge of my life is something I have been trying to do but to do it with confidence, now wouldn’t that be something else. Confidence grows with accomplishments. Instead of setting impossible goals I have set goals which I know I can achieve. In fact, this year on reflection I have set and achieved numerous goals. And yes, my confidence has grown in the sense that I know that I can accomplish goals which are important to me and not to anyone else. I do not need others to endorse what I have achieved but with every goal achieved the confidence which leads to the determination to set more goals. Personal goals have ignited passions within me and together with the determination I have scrapped some goals. And that is liberating. Sometimes we may set goals based on what others think they should be rather than being true to ourselves and the goals which we know are good for us. Sometimes we need to have the confidence and determination to listen to our inner voice and ignore those who really don’t know what ignites our passion. “Don’t let others define you”. Sometimes it is difficult to let go of the goals which were set 20, 30 even 40 years ago. I have found the goals of years ago which I had set but had not achieved had been hanging around me like this big ball and chain. This year I realised that one goal in particular was not going to define me. I actually admitted to myself that I had felt a failure for not having achieved it. However , on reflection I realised that it hadn’t really been my goal but instead I had thought that it should be and it would give me a sense of worth. The relief of finally saying that I didn’t need to take on someone elses goal was immense. It was also liberating. It is good to set goals but it is even more rewarding when the goals are one’s we set for ourselves and follow through with confidence. 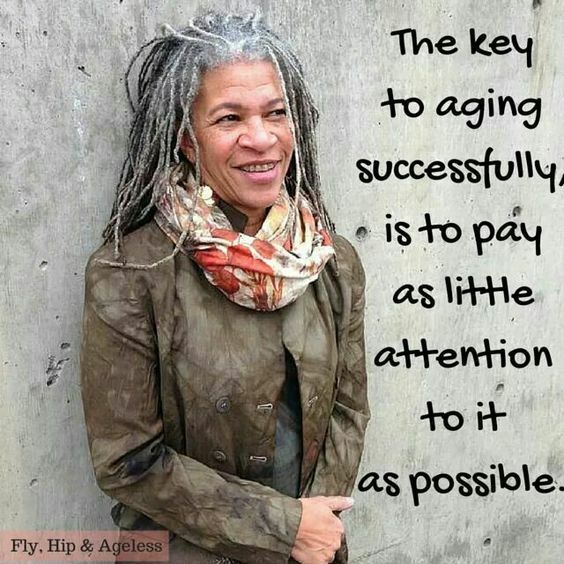 Sometimes as we grow older we forget that goals are not just for the young. Setting personal goals keeps us going. It adds spice to our lives and enriches our lives. A few years ago, I was introduced to machine quilting. Let me say from the outset it wasn’t something I would have chosen for myself and I will always be indebted to my husband for purchasing the machine for me. Quilting will always go hand in hand with the concept of encouragement. In fact, it is not the concept but the reality of encouragement. Firstly, my husband, getting the proper advice for the sewing machine; secondly the encouragement from two friends to book quilting rather than sewing classes; and finally finding the right location for those classes. Four, two-hour classes and I had a lap quilt, having learnt how to cut with a rotary cutter, to thread, sew, change bobbins and importantly not to be afraid to make mistakes. Since then the most important tool I have is a Jemima. Jemima is a ripper so as this ripper has a name it just shows how often I use it!!! I have begun to understand how friends have been so absorbed in occupations and hobbies fabric related. It is so tactile. From choosing the fabric, treads batting to the actual making of the quilt top each step is tactile. However, I have digressed here from writing about quilting and encouragement. Every step along the way I have been encouraged. Roisin telling me get a piece of old fabric and sew. “Put the foot to the pedal and sew”. Then there was the utter magic of those four quilting classes with three ladies whom I am telling you have the patience of Job. Honestly it amazes me when looking back how they survived me and kept their cool. I have continued to try new adventures in this my 60th year. I am writing this overlooking the Aughrim river on a sos beag (small break) from a Quilting Retreat. Yes, I am attending my first Quilting Retreat. It is an absolute blast. A retreat led by Trina, Sinead and Marie from Appletree Crafts and attended by ladies who have offered nothing but support to each other . The tips and generosity of spirit has been so special and uplifting. FeaturedPosted on July 3, 2018 Categories PoetryTags Book, Friends, life, Musings, Poetry, Sharing, sleep3 Comments on Where Have I heard that Line? So, it’s official Ireland is in the middle of a Heatwave. Temperatures reached 30C yesterday. Now this hasn’t happened in a long time. So many young people in Ireland have not experienced a long period of dry weather never mind a heat wave. Still the chores needed to be done. The mound of ironing had morphed into a mountain and the world cup was calling to me so ironing in front of the TV worked well. That was until the final scores when Senegal were knocked out of the tournament. They had played well although yesterday their finishing let them down. I was delighted that Japan had got through. I then watched the Japan v Poland match. What a shock to see so-called professional footballers passing the ball to one another with no attempt to play it in the oppositions half for a full 15 minutes. 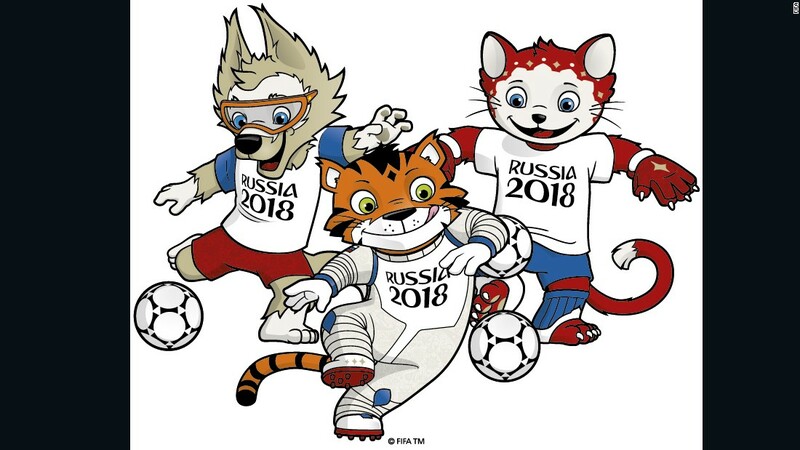 It was obvious that the teams had decided, that if the score remained as it was with Poland having won by a single goal, then Japan would go through to the final 16 and there was no need to actually play football. How dare these so-called professionals do this? Do they not know, that their supporters would have had to save for perhaps a year to travel and purchase tickets for the World Cup? Do their supporters not deserve to see their national team playing until the final whistle? I would have been ashamed if the Irish Republic’s team had played in such a manner. Thank goodness I didn’t scorch any clothes while I ranted and raved. But it was a very disappointing way to end a football match no matter what the reason. Yet another hot summer day is over. It feels rather strange to be constantly seeing blue skies. Eight o’ clock in the evening and the sun is not just shinning but still has heat. I am glad of our shaded back garden. Paper, pen and a glass of cool water is a nice novelty. This afternoon I spent hibernating from the sun and totally enjoyed the time. A beautiful lunch followed by the world cup in the company of my son. Now I was sure that Germany was going to win and had a book ready to hand just in case. The book remained where it was. The game was great to watch. Having German friends and just recently back from a short break in Wurzburg I was up for Germany. In fact, I was sure they were going to win as I think most people were, except perhaps the Korean team. Korea played football from the very first minute. It was great to see. They ran at the German team. They played as a united team with the determination not to be intimidated by the World Cup holders. At the same time Sweden were playing Mexico. Until this tournament Mexico would not have been one of my favourite teams all because they put us out of the World Cup 1994 in the USA by beating us 2 goals to 1. This year though, they have played great football especially in the match against Germany. So today I have had mixed emotions while watching the football; sad to see Germany departing while at the same time admiring the way the Koreans played. I was delighted to see Mexico through though today they didn’t play well and if they continue in the same vein they will not progress much farther. Today’s hibernation took a different root to what had been planned but…. I am not a summer person. I think I spend more time inside during the summer than at any other time of the year. This year has been so warm that I have hibernated and enjoyed my hibernation. Books, books and more books interspersed with football, rugby and the odd film. The anticipation of Wimbledon and the World Cup followed by the Tour de France it is just a pleasure to hibernate. Now, I do have to admit that there are some lovely aspects to a dry hot summer. It is wonderful to be able to sit out in the garden in the evening with sun gone and the air still warm. It is wonderful to be able to go for a walk in the evening without having to carry an umbrella or coat. No need to plan for those showers of rain. A sound which epitomises Summer for me is the sound of bees. There is a hedge in the back garden which attracts the bees. It is covered in tiny flowers at the moment and the bees just swarm around it. There is also woodbine in the hedge and the sound of bees is just magical. This photo was taken by my husband John showing a honey bee in the garden hedge. However, what I enjoy the most is being able to wash the clothes, peg them out and know that they will be dry in a few hours. There is a different smell from clothes which have dried in the air. And what about getting those duvets dried? Sheer bliss. A little piece of heaven when folding those winter duvets after drying in the sun. That smell of sunshine seems to linger. Just one word of warning, if you are washing pillows please check that no minute tears have mysteriously formed before washing pillows. I did not take adequate time to check and ended up with an empty pillow and a washing machine full of fibres. Such is life. So yes, I suppose I do enjoy summer but in my own way which perhaps is not the norm. then again who says what is the norm? Enjoy your day wherever you may be. Do you have a pet hate? You know what I mean, that little something which just aggravates? Now I am not talking about major hates that just is a waste of energy. No I am talking a bout those little niggles. Perhaps it is those Blonde jokes or those Paddy jokes. Perhaps it is someone chewing gum with their mouth open. Perhaps it is someone pronouncing your name incorrectly. Perhaps it is someone wish you “happy holidays” instead of “Happy Christmas”. T hey are not major things just annoyances. Well one of mine is to do with Saint Patrick’s Day. As most people are aware, March 17th is Saint Patrick’s Day which celebrates one of the national saints of Ireland. It is a national holiday here and it is celebrated worldwide. The day itself is known as St. Patrick’s Day or Paddy’s Day but NEVER EVER Patty’s Day. The reason why is rather simple. A patty is a piece of minced or ground meat mixed with seasoning and fried😂 ( it tastes very nice). May I wish you a very Happy St. Patrick’s Day wherever you may be.